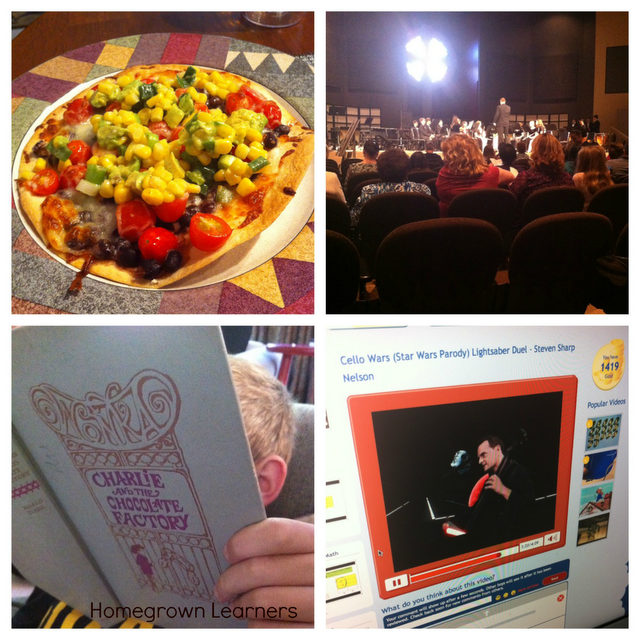 Homeschool Motivation & Cello Wars! Sometimes you just have a few magical homeschool days in a row. That happened here this week. My daughter decided she wanted to learn a certain pop song on the piano. She printed the music and spent several hours learning it... it is hard for her level of playing, but she DID IT. As I type she is in the piano room with her friend making a video of the song. We've been having a little trouble with motivation recently. I know this just goes with the age, but I was so glad to see her really EXCITED about something. This creativity and inspiration wouldn't have happened if she was in school. There would have been NO TIME to just sit at the piano and create. Have you seen the new tab here, "Music Notebooking Printables"? 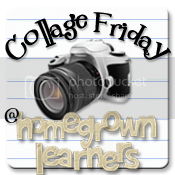 I'm adding to these printables weekly, hopefully to encourage you to incorporate music in your homeschool. I've been neglecting science recently (to everything a season, right?) ... but we've started something new -- Elemental Science. You'll hear more about this, but this classical driven science curriculum seems to fit us VERY well. We've also been working on a few home projects - nothing major, but getting some painting done, blinds hung, estimates, etc... The kids are learning valuable lessons in price comparison, dealing with workmen, and patience. I'm also learning to deal with a bit of a mess (this is SO HARD for me!) and exhibit some patience myself. 1. GMan's last baseball game ~ followed by a pizza banquet and trophies. He had a great season and still plays a solid first base. He is even giving ME batting lessons in the backyard. 2. Playing Bible Drills in Sunday School ~ this is such a fun game and a great way to learn your books of the Bible. This basically is the kids holding their Bibles up (called "drawing their weapons"), then the teacher calling out a verse. The kids repeat their verse and then find the verse as fast as they can. My husband has been teaching in this class of 4th-6th graders all year, and next year he and I will be teaching the class together. I think it's going to be a lot of fun! 3. We're ALL trying to be more healthy. My husband is incredibly fit.... he works out almost daily and is very self-disciplined. I have cut way back on what I'm eating and we got to the YMCA to swim laps this week. While there the masters swim coach asked if I wanted to start swimming on their team - it meets at a time that is very convenient for me, so I think I'm going to give it a try! I swam quite competitively growing up and it something I enjoy doing. I am not doing anyone any good by being a "homeschool mom martyr", know what I mean? It's time I got myself in gear and back in shape. 4. After the used book sale last week I still had some more books to get rid of, so we donated them at a local book drop. I'm thinking that I might have a few more boxes to take next week, too. 1. 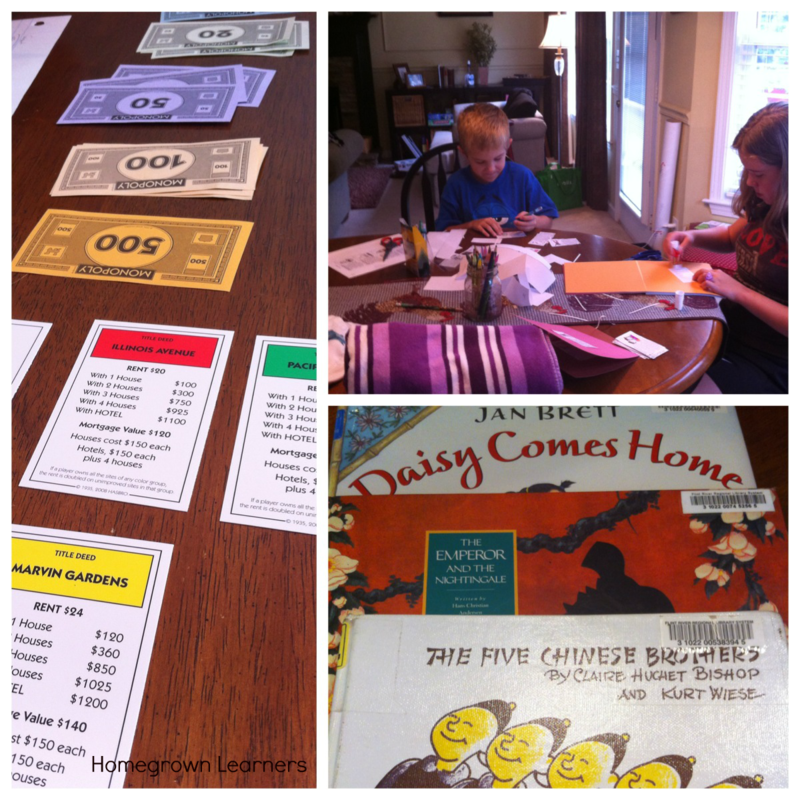 We played a LONG game of Monopoly last Sunday afternoon. This was as good as an entire week of math lessons in my opinion. It was a very close game... but it's so funny how results wind up very close to our money personalities in real life! 2. We listened to a wonderful free version of Tom Sawyer this week while completing history review cards for Story of the World. I love the review cards... my kids wanted to turn them into a little book. Hopefully I'll have pictures to show you soon. AND, on that note: If you have any questions about how we use The Story of The World, please leave a comment and ask. I am planning a post about how we use this history curriculum. I don't see us changing history curriculums anytime soon. I'm not claiming to be an expert, but we are finishing our second year of using SOTW and it works so well for us. 3. Read-alouds for a chapter in the SOTW about Marco Polo and the Mongols. We read Daisy Comes Home, The Emperor and the Nightingale, and The Five Chinese Brothers. 1. Oh my goodness ~ Black Bean and Corn Tostadas were my favorite meal this week. You can see the recipe via Plan to Eat. 2. One of my piano students invited us to her high school band concert this week. We went, and it was really good! It was a good chance for me to talk to the kids about the difference between a band and an orchestra. If you're interested, I'll be putting out a little notebooking set on that very subject next week! 3. In a basement cleaning spree I found a lot of my childhood books. GMan loved reading Charlie and the Chocolate Factory, and he also found my entire boxed set of Paddington Books. I have challenged him to read all five by the end of the month. He loves any kind of challenge with a time limit - I love that little stinker. 4. Something else you'll be hearing more about in the future is Clever Dragons. (I've already blogged about Always Ice Cream) This online community for boys has been such fun. GMan's favorite thing (via Clever Dragons) this week was Cello Wars -- I loved the cello playing light sabers! Clever Dragons definitely wins our favorite resource this week! Remember that Interest Led Music Study of the music of Star Wars/John Williams? How was your week? I'd love for you to join me. 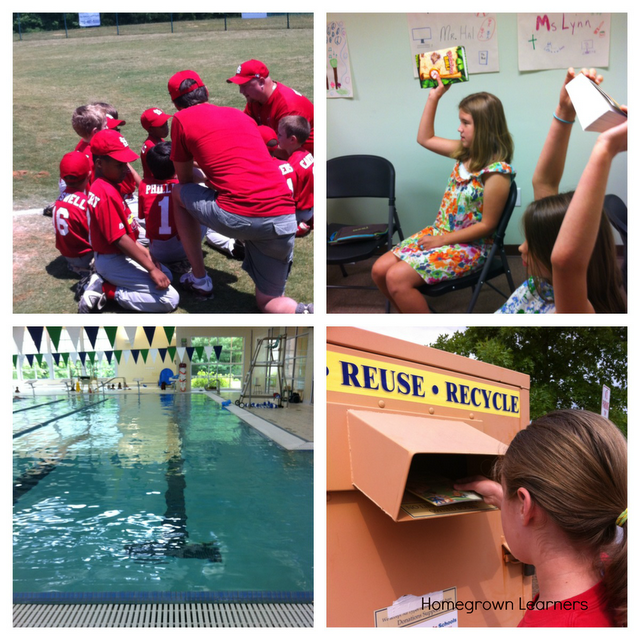 You don't need a formal "collage", just a collection of pictures that tell us about your homeschool week. Be sure to grab the button below, sign the linky, and then visit others on the list to offer encouragement and gain ideas.